H. Upmann 1844 Reserve has been a staple in the humidors of connoisseurs for quite some time. Now, this may be slightly misleading, as the cigar’s title would have you believe we’re talking about more than 170 years! And while it’s true that the world-famous H. Upmann name dates this far back, it wasn’t until the ‘60s that the current iteration took shape; as brand owners Alonso Menéndez and José Manuel Pepe García escaped communist Cuba and the nationalization of private industry. The duo re-established the H. Upmann name (along with their other brands, such as Montecristo) in the Canary Islands, and eventually migrated to the Dominican Republic—where the cigars continue to be made to this day. This was not the final alteration for H. Upmann however, as the cigar would undergo yet another blending tweak in 2011. This time around, parent company Altadis USA swapped the cigar’s Indonesian wrapper for a more rich, Ecuadorian Habano leaf; Dominican binder became Nicaraguan; and the filler blend became entirely Dominican (removing the Brazilian component). The end result? Bigger body, bolder strength, richer texture and complexity… we’d call that a win, win, win! Flavors are of oak, sweet cedar, freshly cracked black pepper, and leather. So while the look and recipe may have changed over the years, the regal experience has remained a constant. Try H. Upmann 1844 Reserve and see why this is one of the world’s oldest, world-renowned names in premium cigars. 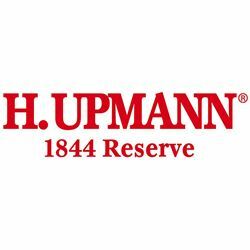 H. Upmann 1844 Reserve Belicoso ranked among Cigar Aficionado’s Top 25 Cigars of the Year for 2012!